Julie is an Instagram friend who has become a real-life friend because we bonded over – what else – tea! I’ve had the privilege of experiencing a sublime tea session over at her place and there really couldn’t be a better person to finally bring awesomely legit tea courses to Singapore. That’s right, Julie is now a Training Director with Australian Tea Masters (ATM), where she previously attained Certified Tea Master accreditation. She’s been super busy setting up a Singapore branch of ATM with an exciting series of tea courses lined up, but for now, Julie tell us more about her amazing tea journey so far. How did you fall in love with tea? I have always been a tea drinker but I fell in love with the world of specialty tea when I started my training with Australian Tea Masters in 2013. I recall being blown away just by the sheer variety of teas available at the training and getting my taste buds awakened to these beautiful natural flavours. Sharyn Johnston, CEO and Founder of Australian Tea Masters was also a key influence. She opened my mind and soul to both traditional and modern ways of appreciating tea, while teaching me to respect the artistry of the tea makers. I was initially repelled by its name until I tasted it. The complexity of the tea, starting from the lifted aromas of stonefruits and the finishing of a lingering sweetness, is just beautiful! It’s one of the teas that I love serving to my guests who are unfamiliar with the range of tea. I enjoy observing how their reaction changes from repulsion to amazement after tasting this tea. I love this because of its intense umami-ness! A good grade Gyokuro can taste almost like a savoury soup and it’s very versatile. You can steep it over ice, brew it warm or even season the steeped leaves with some yuzu sauce for an appetizing cold dish. This tea holds a special place in my heart because I tasted it during my first visit to a tea farm. This farm was in Pinglin, Taiwan and it produced an award-winning Pouchong. The tea leaves had just been picked the day before my visit and hadn’t been sorted yet. But I wanted this tea so badly that we ended up huddling on the ground together with the tea master to sort out the leaves from the stems. The freshness of the tea was unbelievable and came through without any need for fancy brewing equipment. Tell us more about these lovely tea parties for that you regularly organise for friends. In the words of tea author, Ling Wang, “Whenever friends and family sit around a table, a cup of tea will lend its rich aroma and warm presence to any occasion.” I also enjoy introducing specialty tea to the uninitiated. Food and tea pairing or infusing tea into food make great conversation starters. Before, I found it quite challenging to get good quality tea-infused foods off-the-shelf, and it didn’t help that I couldn’t bake to save my life. But because I couldn’t get those crazy tea recipe ideas out of my head, I just had to learn to do it myself. So I really have tea to thank for motivating me to hone my baking skills! My Hojicha Cheesecake and Thai Milk Tea Cookies are pretty much loved by my friends as I emphasise on bringing out those distinctive tea notes. As I have a good number of guests who don’t have much of a sweet tooth, I also started to experiment with tea-infused savoury dishes with the favourites being the Da Hong Pao Smoked Chicken in Mini Chia Seed Rolls (which takes about two days to prepare) and a 12-hour Lapsang Souchong Ajitsuke Tamago – my take on our humble herbal tea egg. What do you hope to communicate to people about tea as a Training Director with Australian Tea Masters? I hope to connect more people to the charming world of specialty tea with its myriad of aromas and flavours. The humble Camellia Sinensis plant has been life changing for me. Its subtlety has made me stop and take time to appreciate the little things in life and the wonders of nature. I hope tea can do that for other people too. With ATM, I hope to make high quality specialty tea more accessible to everyone, especially when one is dining out at a café or restaurant. As much as we have great specialty coffee in Singapore and around the region, tea is still generally very much an afterthought. However, I truly believe in its potential to elevate the dining scene in this region. Also, we hope to give tea professionals here the recognition and credibility that they deserve, just as one would with the coffee baristas and wine sommeliers. We will be launching the Certified Tea Sommelier course in Singapore on 30 and 31 July. This is only programme in the world that is in accordance with the Australian government-approved standards. What was going through Australian Tea Masters Certified Tea Master programme like? It was pretty intense with three full days of on-site training in Australia and after that, having to juggle a full-time job with 14 weeks of assignments back in Singapore. However, it was also very enjoyable as I got to taste and evaluate so many teas over the course. 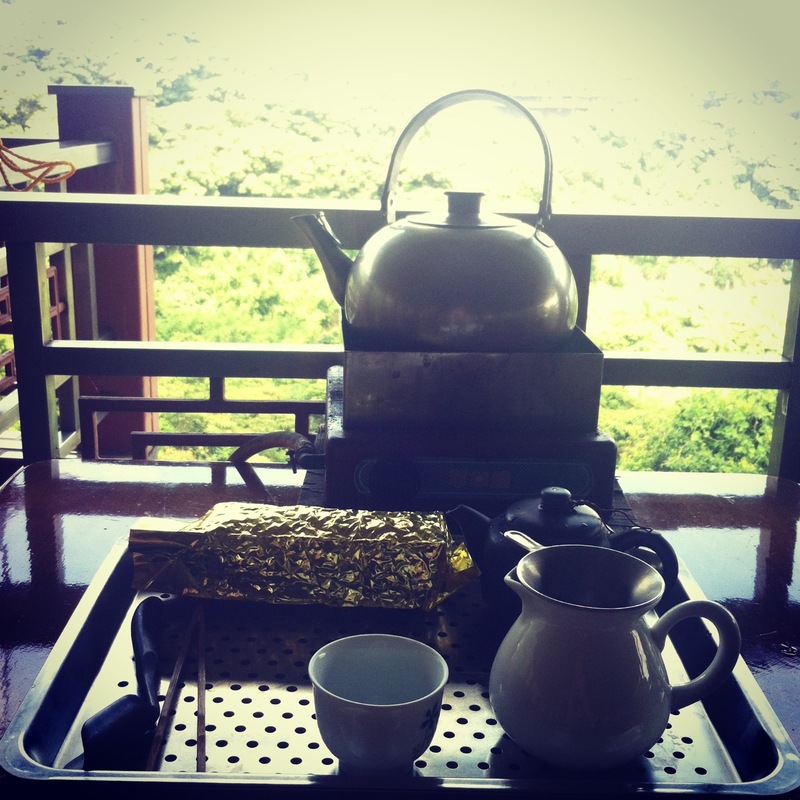 I joined the programme because I was looking for a structured way to learn about teas from all around the world. I also wanted to learn about professional tea service, which I feel does not really exist in Singapore. How did that eventually lead to you bringing Australian Tea Masters to Singapore? While there were many offers to Sharyn for the overseas expansion of Australian Tea Masters (ATM), I was very privileged that she decided to work with me for ATM’s first branch office. I guess we share the same passion for specialty tea and the genuine desire to help the F&B operators in the region with professional tea service. Singapore is also a natural choice as a regional hub for tea education and training given its convenient location and ideal business climate. We are very heartened by the launch of ATM Singapore at the recent Café Asia 2016. Response was fantastic and we are humbled by the public confidence in us. We are also very honoured to have been invited by Food & Hotel Asia 2016 to conduct two mini-tea courses in April. With the Global Tea Menu course, students get to taste and evaluate teas around the world and learn to develop their own tea menu for their business. In the Hands-on Basic Tea Blending course, students will learn about the type of botanicals and flavours which can be added to create a great tea blend and they will even get to make their own blends. What are your tips on getting the most out of your tea drinking experience? Any tea connoisseur will be able to tell you that the selection of tea leaves, leaves to water ratio, type of water, temperature, brewing equipment and brewing time will all affect the taste of tea. But I also believe the state of mind is important to create and appreciate a beautiful brew. A distracted mind will not be able to focus on these variables, nor allow the senses to fully appreciate the subtle aromas and flavours. It’s so important to allow yourself to set aside time to slowly brew and fully savour tea. What do you hope to change about the tea culture in Singapore? I would like to make specialty, single origin teas more relatable and exciting while still emphasising on the importance of detail, craft, skill and respect to a tea’s origin. This is exactly what is now being done at the award-winning Cartel Roasters Brew Bar in Geelong, Australia. It is owned and managed by Sharyn’s son, Nathan James Johnston. He is not just a coffee legend; he has also been shaking up the tea scene with his mother by serving up high quality and rare specialty tea in the most innovative ways such as using the Steampunk brewing machine or the Chemex coffeemaker to coax out those fresh tea flavours. I would like to see such things happening in Singapore too. … a journey of serendipity that enthralls the soul. Find out more about Australia Tea Masters here. 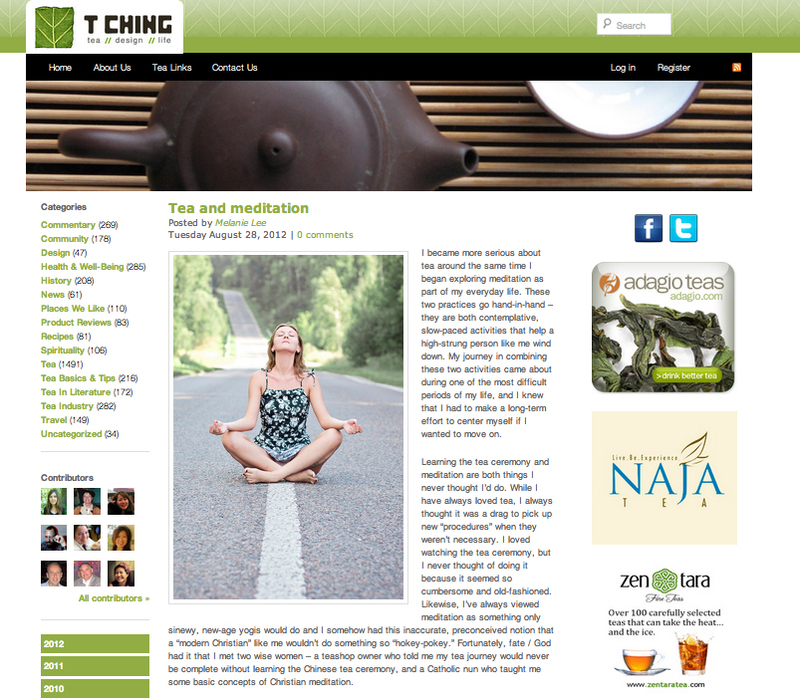 Because of this blog, some journalists have contacted me to provide quotes/information about tea for their articles. I find it rather surreal to be on the other side of the table (usually, I’m the one bugging people to tell me more about tea). Don’t get me wrong however, I’m always happy to share tea trivia and experiences! Something I wrote for T Ching at a rather crazy time in life…and though I thought I wouldn’t be able to write anything, this came out.